1A look at the careers of Hizballah activists and supporters in Lebanon1 often reveals close ties to the party’s satellite institutions, and especially the different schools situated in the party’s sphere of influence. Many teachers of these schools are party supporters, activists or even fighters. Some well-known experts linked to the party are also involved in these schools, including the economist Abdel Halim Fadlallah, some local officials (head of the Khiyam municipality in South Lebanon) or MPs (Hussein Haj Hassan) and even Hizballah Deputy Secretary General Naïm Qassem, a former teacher himself. 2What kind of schools are these? Who supports them and who is enrolled in them? More importantly, what do they reveal about Hizballah and its program, and what methods of allegiance to the party do they seek to emphasize and reinforce? Also, how do they affect the future of the party’s popular support base? 3This chapter will explore facts pertaining to Hizballah as well as social development sponsored by the party from an original angle, that of education. Educational strategies are less likely to be affected by short-term change than political strategies, in which alliances are made and broken. The educational sector is therefore less sensitive to fast-paced political change, and offers interesting insight into Hizballah circles. In addition, it illustrates the nature and degree of party allegiance, and how that allegiance is expressed at various levels of social development in Lebanon. 4In the consociational Lebanese system which is characterized by its relative inability to adapt and its closed nature, social development, which was traditionally delegated to communities and private groups, is a central point for assembling material and symbolic capital that may later be converted into political resources. This study will use the school as a point of analysis to study the role of Hizballah in this system, the resources it can draw on, as well as the limits this very system imposes on Hizballah’s action. 5In addition to the Islamic institutes, or hawzas, which gravitate around Hizballah or were established by its leaders, schools which provide standard formal education and prepare for official state exams appear to be an essential intermediary resource. The party uses this resource to mobilize supporters and widen its influence, both in schools established by the party and preexisting schools. Schools provide an interesting opportunity to observe Hizballah in many respects: the numerous and diverse educational networks that are more or less linked to the party, the speed at which they develop, the diverse profiles of people who attend them as well as the importance that the party leaders seem to attribute to them. 6At the sociopolitical crossroads of party and society, Hizballah schools allow us to shed light on the group dynamics within the hâla islâmiyya, or “Islamic sphere” in Lebanon, and to gain a better understanding of how this sphere fits into the social fabric of the Shiite community. 7Hizballah (literally the “Party of God”, referring to Koranic terminology) began to develop progressively in 19822 as a response to Israel’s invasion of Lebanon, through the coalition of various Islamic groups, such as the Islamic Amal Movement, the Association of Muslim Students, and the Da‘wâ (“Islamic Call”) Party (Shapira, 1988, p. 124), a Lebanese movement originating in Iraq. Established by a group of young clerics in their thirties, including Abbas al-Moussawi and Sobhi Tufeily, the party benefited right away from the decisive support and sponsorship of the Islamic Republic of Iran. Iran played an active role in the party’s foundation and sent a 1,500-strong Pasdaran (revolution fighters) contingent to the Bekaa region in order to train Islamic resistance (al-muqâwama al-islâmiyya) fighters in November 1982 (Mervin, 2008, p. 79). 8The movement was officially formed when it submitted Hizballah’s open letter during a press conference in Beirut’s southern suburbs (known as al-Dâhiya) on February 16, 1985. It went on progressively to become a new player in the political and militia arena at national and regional levels. Hizballah took control of al-Dâhiya following a violent conflict with the Amal Movement between 1987 and 1989; Amal, established in 1974 by Imam Moussa al-Sadr, was the most prominent Shiite movement to that day. During the 1990s, Hizballah acknowledged the regime born after the Taif Agreement and initiated a process of “Lebanonization”: It postponed indefinitely its project of establishing an Islamic republic in Lebanon and joined the political game. Since then, Hizballah has taken part in the 1992, 1996, 2000, 2005 and 2009 legislative elections as well as the 1998 and 2004 municipal elections. Hizballah is also suspected of involvement in several attacks on Westerners in Lebanon during the 1980s, or abroad in the early 1990s. It therefore remains an outcast movement in the eyes of the international community, especially the US administration, which labels it as a “terrorist” organization (Droz Vincent, 2008). 9On May 25, 2000, Hizballah, which was already popular within the Shiite community, was greatly consolidated and legitimized nationally when the Israeli army withdrew from the large strip of territory it occupied in South Lebanon – all except for the Shebaa Farms and a few villages along the border, whose incorporation into Lebanon remains controversial. The party then gained even more power and influence in the Lebanese political arena. In September 2004, the United Nations Security Council issued Resolution 1559 that called for the disarmament of all militias in Lebanon. Former Prime Minister Rafik Hariri was assassinated on February 14, 2005, and Syria withdrew from Lebanon in April 2005. In the wake of these events, Hizballah repositioned itself on the political stage and joined the government in July 2005, following the parliamentary elections. Even more important was the 2006 July-August War against Israel, which ended with Hizballah’s “Divine Victory” according to its own terms, and led to the party’s reinforcement. From this point on, Hizballah became a major, if not the major, player in the Lebanese political scene. Its spectacular alliance with General Aoun’s Free Patriotic Movement on February 6, 2006 demonstrates its wish not to remain politically confined within the framework of its own community. 10In parallel, the party has been active ever since its inception in social and economic development, offering aid and services to an increasingly large and diverse number of people within the Shiite community. At first, these services often emanated from organizations that were mere Lebanese branches of Iranian mother associations. The Martyr Foundation (mu’assasat al-shahîd) was thus established in 1982 under the aegis of Iranian organizations; the same holds true for the Imam Khomeini Relief Foundation (Harik, 1994, p. 24). Charities were already present in al-Dâhiya prior to 1982, but the Iranian Revolution supplied them with a new dynamic and unprecedented resources. Hizballah’s organization for real estate, Jihâd al-binâ’, was established in the middle of the 1980s and was acknowledged by the state in 1987 as an organization dedicated to providing support for the poor. These agencies began providing services in education, whether directly or indirectly, during informal courses or sessions organized by Hizballah. It was in the 1990s however that the party launched a large-scale, structured initiative in the field of education by opening its own schools. Gradually acquiring expertise and with the diluted efforts made during the conflict (Harik, 1994), the party rapidly became a new key player on the educational scene in Lebanon. Several institutions came to represent Hizballah, the most important of which were al-Mahdî schools, established in 1993 and directly linked to the party in its early stages. 11Since the 1990’s,Hizballah’s social development program has been characterized by its considerable size and coherence, despite the complexity of organizational networks responsible for implementing it. As an integral part of the party’s program, education holds a special place in its operations. This comes as no surprise in Lebanon, where social work and education are often supported by private and/or communal actors. In fact, the Lebanese state, through political sectarianism, encourages institutionalization within separate communities who are urged to organize themselves by creating their own associations, whether directly or through the political and religious entities who represent them. This encouragement is particularly significant in the areas of law, education and religion. Educational developments supported by communities are explicitly acknowledged and protected by Article 10 of the Lebanese constitution3. In practice, the foundation and management of these schools is in line with values of evergetism as well as social or religious obligations. An element of political strategy for “traditional” leaders, the opening of schools is supported by newcomers in politics and political parties, alongside actions taken by religious groups. 12Despite the novelty of Hizballah’s actions in the area of education, namely its temporality and specific religious and geopolitical affinities, this process mimics in fact a phenomenon observed among various groups at different times in the Lebanese system. Historically, it was the Catholic educational model that left its mark on the organizational development of the various communities, influencing the other Christian sects and then the Sunnis in the 19th century. More recently, this phenomenon of school institutionalization was observed within a particularly dynamic Shiite community. The Shiite involvement in the Lebanese political system is the result of relatively recent socioeconomic and demographic changes which led to an increase in the number of social and charitable institutions established by this community, even before Hizballah undertook any specific action. Education became the preferred development area for a community that was previously almost absent on this level. Even though it is more discreet and progresses at a slower pace than the Shiite political upsurge, this social mobilization is proof of important structural evolutions. It reveals the process of community consolidation that has been taking place since the 1960s. The involvement in education, which gained strength particularly after the end of the civil war, extends and consolidates the political benefits acquired by the Shiites in the last decades; it also lays new foundations for Shiite institutions and identification processes. While Hizballah has been the figurehead of this overall dynamic since the 1990s, we must also take into consideration other players in Shiite education. These include the network of schools established by the Amal Movement, Hizballah’s partner and foe at the same time, or the Mabarrat, a series of institutions established by cleric Mohammad Hussein Fadlallah. Hizballah’s action take place within the framework of this newly-established, albeit diversified and dynamic, educational landscape, but it differs from other networks in how it is articulated to political and religious spheres. 13To some extent, Hizballah can be perceived as a social movement similar to many Islamic or Islamist movements in the Muslim world, which use more or less formalized social networks to substitute for or complement political action in the strict sense of the word (Wiktorowicz, 2004, p. 10-12). 14In reality, the party’s strategy seems to include the slow process of mobilization which takes place at a local level through the NGOs that revolve in its orbit. Janine Clark (2004), Linda Herrera (2003; 2006) and Quintan Wiktorowicz (2001; 2004) have described how these types of organizations (schools, hospitals, cultural centers) can play the role of mobilizing mediation structures for Islamic activism across the Middle East. Far from being restricted to Lebanese movements, this type of “social development strategy” is also used by the Muslim Brotherhood in Jordan or Hamas in the Palestinian Territories. The result is an increase in the party’s material and symbolic resources as well as a “mobilization of loyalties” (Chazel, 1993; 2003, p. 119-120) by consolidating solidarity between supporters and users. 15School, in particular, is seen as the spearhead of a broader social movement, especially as it performs numerous functions and can affect several generations of users, whether directly or indirectly. In addition to being used by a leader or a party as a platform for action and electoral mobilization, school appears as a family-oriented institution of public interest, a significant source of local job opportunities, a socializing group for students and a potential springboard for social climbing. 16Islamic schools therefore become levers for the action of Islamist movements such as Hizballah. As such, they fall within the classification suggested by C. Tilly (1978, p. 73-74) who distinguished between defensive and preparatory mobilizations. A defensive mobilization works against the threat of other groups, while a preparatory mobilization prepares for future threats or opportunities. While the opening of a school may be seen as the response to a certain threat of “de-Islamization” or Westernization (defensive mobilization), it also springs from Hizballah’s desire to expand and promote its position, as a place where resources and allegiances are hoarded (preparatory mobilization). Hizballah schools are the result of past mobilization processes and at the same time, they are stepping stones for future actions in a process whose dynamic character is expressed in the very name of the party’s educational group, “Mobilization for Education”. In addition to its educational and social roles, schools then participate in a series of “integrated mobilizations” at the social and political levels, in the short or long term. 17The mobilizing and socializing functions of schools actually interact and reinforce one another. Mobilization, in its dynamic nature, can offer a socializing experience to its players. Conversely, socialization can also be seen as a form of preparatory mobilization. Socializing is tantamount to the potential strengthening of allegiances, thus creating new resources that can be mobilized at a later stage. These functions, though separable, are constantly overlapping in practice and are implemented in a very conscious way. This reflects the holistic aspect of Hizballah’s project and its philosophy of action, operating both at the highest levels as well as in ordinary daily life. 18In the system of action formed by the party and its supporters and voters, the question arises as to how the two functions interact. Often described as “client-centered” in Lebanon, the network of relations between political leaders and the so-called “civil” society is indeed characterized by a dyadic, asymmetrical relation in which services and votes seem to interact. As Myriam Catusse and Joseph Alagha (2008) point out however, there is a complex relation between the provision of services and electoral benefits, and it becomes all the more complex in Lebanon given the fact that voters do not cast their ballots in their place of residence. Although the establishment of a school does not automatically4 guarantee electoral benefits, the political loyalty which results from the provision of educational services does exist. The expression “client-centered” is insufficient however for understanding such larger and more complex processes. Support, for that matter, does not only take the shape of votes, but also of more general or symbolic allegiances to the Islamic resistance or to certain causes supported by the party. Support can be expressed in different ways, such as participation in mass protests, loyalty to Hizballah media as a source of information, and the support – or simply the lack of criticism – of the party’s action. 5 On the issue of the relation between the “civil” and party spheres, refer to Karam (2006). 19On the whole, Hizballah’s Islamic schools open against a backdrop of client-centered practices which are sometimes binding and to which they are sometimes obliged to adhere. Yet these schools go far beyond this somewhat instrumental outline as they seem to be organically linked to the community. By spreading normative as well as practical models, Hizballah-affiliated schools are, in fact, building foundations. First, they are building a social foundation that is likely to channel mobilizations; second, they are potentially training some of the movement’s future leaders; and third, they instill cognitive principles which “make sense” to their audience. As a host for potential supporters as well as for confirmed militants, Hizballah Islamic schools blur the sharp division that is sometimes made between “civil society” and “partisan society5.” In the case of Hizballah, or, a major portion of the Shiite community, this distinction seems to dissolve. Instead, we observe the establishment of a true “resistance society”, supporting the fight against Israel on the outside and promoting the party’s ideals and projects on the inside. 20In doing so, Hizballah aims to fulfill a global mission by installing an alternative society. This holistic approach justifies its being labeled as a “social movement” with its own agenda, its strategies, its mobilization agencies as well as its set of values. The various missions of the party, which all revolve around the notion of Islamic resistance, are substantiated in different sectors of social life. This high level of integration enhances the party’s remarkable capacity for political mobilization (Harb, 2005, p. 27). In a much sharper yet different way than the older associations which shaped Lebanese society, Hizballah uses schools as building block for an “alternative society”. This social universe may even be described as a “counter-society”, mirroring the concept used by Annie Kriegel (1985) to describe the structure of the French Communist Party, which was later adapted to the Hizballah’s case by Waddah Chararah (1998). School takes place within a global institutional complex comprised of mosques, leisure centers, local aid associations and scouting groups. All these structures provide opportunities for users to get closer to the party and become supporters. Once again, Hizballah innovates more in terms of the magnitude and meaning of its project than in terms of organization. Indeed, since the 1980s, other movements within the Shiite community have strived to develop a more or less integrated system of social institutions6. In the case of Amal, these structures were linked to the State or even attached to public institutions. This whole system however, may work to serve its clients but it has no vision for an alternative society. In this respect, Amal blurred the limits between the public and private sectors. This phenomenon is observed through the party’s control over some public schools in the South in addition to its own educational network, Amal at-tarbawiyya. In the case of Hizballah institutions, the frontier between public and private sectors has been more or less restored7; meanwhile, the divide between the private institutions which depend directly on the party and those which do not is greatening. More importantly, the rational and “holistic” approach to the needs of individuals or groups gives Hizballah’s project a whole different dimension. Entering a Hizballah-affiliated institution means potentially adhering to a whole new value system and joining the party’s stratified and “total” society. 21DespiteHizballah’s reputation as a centralized and authoritarian party, a number of semi-autonomous organizations work in its shadow, via several types of social institutions which revolve around the party without being officially attached to it. In the area of education, this flexible functioning operates on two levels. First, it appears in the management of Hizballah-related schools with the existence of different networks which are more or less related to the party according to their history, their operating methods and their type of clients. While some owe their existence to the party (al-Mahdî schools), others predate Hizballah and joined the group only later, under the influence of leaders (al-Mustapha schools and Naïm Qassem). Others still branches of Iranian associations, which were set up in Lebanon during the civil war (al-Imdâd). Al-Mahdî, al-Imdâd and al-Mustapha networks constitute the three pillars of Hizballah’s educational program; together, they were providing formal education to more than 25,000 students in 2005. 9 Interview with Hussein Hajj Hassan, February 2007. 22Second, Hizballah’s sphere of influence goes far beyond these networks in that it encompasses a whole section of the Shiite educational and recreational sector in an indirect way. The “spirit” or the “atmosphere” which are characteristic of Hizballah schools are displayed in other networks that possess varying degrees of importance and autonomy. The unclear relationship between some of these associations and the party, and the ambiguous affiliation of some so-called “individual” schools reinforce this phenomenon, which can be spatially described as a set concentric circles or ellipses drawn around Hizballah8. Defining the limits of these “circles” to determine which schools are more or less close to the party is not an easy task. It becomes even more complicated when we consider the ever-changing borders of the group and the high degree of porosity in its margins. In addition to the major networks which are notoriously linked to the party, it is important to take into consideration a “gradation” of schools which are more or less formally integrated within the hala islamiya9. This institutional complexity as well as the determination of supporters who wish to consider Hizballah as a lifestyle or an “attitude” rather than as a party in the classical sense of the term, lead us to explore both institutions which are linked loosely to the party as well as those which are at its very heart. The difficulties encountered in attempting to define the borders of the circle of “Hizballah schools” are proof of a wider question, namely the very nature and influence of the party. 12 According to the president of the association (Interview with Mustapha Kassir, February 2005). 13 Especially thanks to school fees. 23The first schools which come to mind when we consider Hizballah-run schools are al-Mahdî schools, which the party started in 1993. These schools rely on the Islamic Institution for Education and Teaching10, an association established by Hizballah members including MP Hussein Hajj Hassan, formerly the head of education within the party11. Al-Mahdî schools developed at a spectacular rate in their early days. In 2001-2002, 9,864 students were enrolled (Ghorawi, 2004, p. 146) in Lebanon and in 2004-200512, that number had jumped to 13,500. This substantial growth was achieved “internally” through the construction of schools, as well as “externally” when preexisting institutions acquired the “al-Mahdî” label and adopted its methods and procedures. While the Islamic Institution for Education and Teaching was directly related to Hizballah’s educational unit (Mobilization for Education) in the beginning, today it enjoys a certain level of administrative and financial autonomy13 under the aegis of its president, Sheikh Mustapha Kassir. 24The development of this school network seems to have leveled off in the mid-2000s, even though a new school is set to open in Hadath (al-Dâhiya) toward 201014. The fiteen al-Mahdî schools were providing formal education to approximately 14,000 students and 800 employees in 2006. These schools are located in the three Lebanese regions which have a strong Shiite majority (seven schools in the South, four in the North Bekaa and three in the southern suburbs of Beirut). Through these schools, the Islamic Institution for Education and Teaching aims to provide a formal education that is both rooted in a corpus of Islamic values (such as the party imagines and applies them in society) and is adapted to Lebanese official state school requirements. 25In al-Mahdî schools, teachers are chosen according to a variety of criteria defined by the Islamic Institution for Education and Teaching. These criteria include teaching skills, but also adhesion to Islamic culture and a respectable way of life (which can be confirmed through local inquiries if need be). Teachers at al-Mahdî schools and their families are, by and large, known to be committed to Hizballah, in which they sometimes have religious, political or even military functions15. While these institutions abide by the official Lebanese curriculum, as do their sister establishments of all denominations, they also stress the importance of religion, and a specialized coordinator watches over this matter. Islam, as conceived by the party, is objectified in a religion course taught during two hours every week, as well as through a series of lifestyle rules, clothing and behavioral standards. More generally, Islam appears to provide a code for the management of time and space at school. In al-Mahdî schools, as in all schools which belong to Hizballah’s sphere of influence, girls have to wear the hijab (veil or scarf) as early as from the age of nine (according to the Hegira calendar), and the same holds true for women teachers. The calendar is marked by the dates of birth and death of Shiite imams, by ‘Ashura - the celebration which commemorates Hussein’s martyrdom in 680 in Karbala –, and by the important dates that have been marking the Islamic resistance history in Lebanon since 1982. School decorations use the same themes, as do field trips, which often take students to major sites of the “resistance society”. The desire to create a “resistance generation” goes along with an emphasis on what is seen as “modern” (technologies, the environment, health and scientific knowledge) or “citizen-oriented” (particularly the promotion of Lebanon and the Lebanese flag next to Hizballah’s). Politics, religion and school knowledge come together in harmony within the framework of a comprehensive model that aims to foster a resistance-oriented behavioral pattern among students. 16 Interview with Hussein Hajj Hassan, February 2007. 26Though well known, al-Mahdî schools do not include all of the Islamic Shiite schools which spread values and practices enforced in the “Islamic sphere” or in the “resistance society”. Other networks, which are linked to one another via “decentralized connections16”, have joined Hizballah’s sphere of influence. This study will focus on the presentation of two organizations that have joined Hizballah’s circle, namely al-Imdâd and al-Mustapha schools. This approach has the advantage of shedding light on the diversity of structures and audience in Hizballah-related institutions; it also stresses the relatively flexible methods of allegiance or identification to the party. 18 Interview with al-Imdâd’s PR official, February 2005. 20 Interview with the headmaster of the al-Imdâd school in Hadath, January 2006. 27Al-Imdâd, an association of general interest, was established in 1987 as the Lebanese branch of the Iranian association with the same name and was licensed by the Lebanese state in 1988. Today, it has definitely acquired a Lebanese identity even though it is still administratively linked to its mother association. Al-Imdâd has been headed since 2008 by the mayor of Khiyam, Hizballah-affiliated Ali Zreiq. The association was originally founded to help families in need and it has been active in several fields, including education17. Al-Imdâd manages several centers for the handicapped and five school complexes that were initially built to reduce the number of street children during the war18. Four thousand students are enrolled in these schools today. The association’s charity initiatives are clearly more present than in other associations within Hizballah’s sphere of influence. Still, only 20% of the students enrolled in these schools come from “very poor” environments, while the others belong to the lower middle class (employees, craftsmen, retail traders)19 of underprivileged regions, since the organization has relatively low school fees. In Hadath for instance (southern suburbs of Beirut), the Imam Khomeini School, which is part of al-Imdâd group, was providing formal education to around 2,000 students in 2005. It was also managing, in partnership with the State, a public technical teaching center located in the same building20. 21 Observations made at the al-Imdâd school in Mueisra, January 2007. 23 Interview with Ali Zreiq, director general of the al-Imdâd association, February 2005. 28The Al-Imdâd association chose to settle in al-Dâhiya as well as in regions where the Shiite community is less predominant, such as West Beirut, Batroun or the West Bekaa. Al-Imdâd also runs a school in the village of Mueisra in the Nahr Ibrahim valley (Jbeil area, north of the caza of Kesrouan). This unusually situated Islamic school was established in 1993 in the context of the growing assertiveness of the Shiite minority in the Nahr Ibrahim valley, a predominantly Christian region (Dumontier, 2004). In 2007, the school was providing formal education to approximately 225 students, a number which continues to increase according to its headmaster. Even though it is located in a Shiite village that is far away from the main strongholds of the Shiite community, the school displays all the symbolic Islamic icons and accessories of the hâla islâmiyya and respects the major dates of the Shiite religious calendar21. It therefore contributes to a process of greater mobilization of the region’s Shiite inhabitants based on a sectarian divide. It also promotes the consolidation of territorial, religious and partisan identities, reaching out to Shiites who did not previously benefit from this kind of institution. The Al-Imdâd Mueisra school also benefits from a Jaafari Shiite endowment (waqf), which bears witness to existing relations between private associative networks and community assets22. In Mueisra, as in Beirut, enrolled students belong to the poor and middle classes. School fees within al-Imdâd network vary according to the level of education and to the region (from $300 in an underprivileged region to $1,200 in Beirut, for high-school classes23). Past this amount, school is only accessible to the more well-off Shiite middle class, which is targeted by another network situated “further” within Hizballah’s circle of influence, namely the schools of the Islamic Religious Education Association (Jama‘iyyat at-ta‘alîm ad-dînî al-islâmî, JTDI). 29The JTDI association, which manages the Mustapha schools, has become a key institution in the field of general and religious teaching within the Shiite community. This association was established in 1974 by a group of clerics supported by key religious figures of the Shiite community. Its aim was to ensure the religious education of young generations by training religion teachers who would be active in public and private schools across Lebanon. The JTDI is officially headed by Sheikh Ali Sinan and comes under the more informal supervision of Hizballah’s Deputy Secretary-General Naïm Qassem. Qassem headed the JTDI for a long period of time (between 1974 and 1988) and he still participates to this day in all of its major events. After a chaotic start due to the war in Lebanon, the Islamic Religious Education Association opened a teachers’ training school for religion teachers in 1977 and obtained a license from the Ministry of Interior in 1981. It has continued to grow ever since, and today it trains some 25 to 30 religion teachers every year in its “Teachers House.” The association advocates a practical conception of religious teaching that is adapted to students’ needs; more implicitly, it also spreads a version of Shiism that conforms with Hizballah’s religious and sociopolitical principles24. 30The JTDI staff, comprising about 300 teachers in 200525, is spread over public and private schools in predominantly Shiite regions. In class, the vast majority of teachers use the textbook published by the JTDI, al-Islâm risâlatunâ (“Islam is our message”). This religion textbook is the most widely used in the Shiite community26 in all classes up to the Baccalaureate level. It offers children and adolescents a “simplified and scholarly” form of religion, which promotes their insertion into the Islamic sphere. 27 Interview, JTDI, Haret Hreik, September 2005. 31Al-Islâm risâlatunâ is particularly used in Mustapha schools, which were established by the JTDI as of 1984, first in the southern suburbs of Beirut, then in the South and the Bekaa. The six Mustapha schools had approximately 8,300 students in 2005; they aim to “provide all Shiite regions with excellent schools27.” School fees in these relatively elitist institutions can reach up to $2,000 US a year for high school classes28. The existence of these schools therefore contradicts the idea that Hizballah institutions and, more generally, those established by Islamic movements in the Arab world would only educate the poorest of the poor, based on charitable efforts29. In fact, it seems as though Hizballah-related institutions span all levels of the Shiite community, much like the party’s voter base30. 32Al-Imdâd and al-Mustapha schools target different socioeconomic levels and complement one another geographically in terms of covering Shiite regions. They also contribute, however, to the potential homogenization of Shiite areas on cultural and ideological levels. Rites, ceremonies and conferences organized in these schools are remarkably similar. The icons are also similar, even though they are sometimes more discreet in al-Mustapha schools. The two school magazines, Al-Midad and Ajial al-Mustapha, published by al-Imdâd and al-Mustapha respectively, discuss – each in their own way – the themes which prevail in the Islamic sphere: “resistance” and its great figures, the life of the 12 imams or the Prophet, as well as some practical issues (hygiene, the environment, and common knowledge). These two networks also use the same history and religion textbooks despite the diversity of options available for these two subjects31. They are partly financed by the khums32: Every year during Ramadan, they organize one or more iftâr (meal served at the end of the day during Ramadan to break the day’s fast) to which some of the key religious and political figures of Hizballah’s circle of influence are invited, as well as rich donors. 33These two networks also have in common days off, including strike days, in a context of strong political polarization in Lebanon. Politicization is very evident here, whether it be “spontaneous” (emanating from students or teachers) or by decision of the schools’ administrations. The militant dynamic in schools is further reinforced by the latter’s role as a soundboard for outside events, which are frequently commented on within the institution. Furthermore, political figures close to the party use the schools as a stage, such as in the case of Sheikh Naïm Qassem with al-Mustapha schools, and Mohammad Fneish – to cite just one example – with al-Imdâd schools33. 34Just on the fringes ofHizballah’s close circle of influence, or within a “grand peripheral ring”, more modest structures extend and spread the party’s action in a less formalized manner and contribute to the creation of a common vision for action within the “resistance society.” This society seems to grow thanks to the active creation of mobilizing structures, but also by “coalescence” or “accretion”, i.e. by impacting existing institutions established by private individuals. 34 Interview with the headmaster of a private school in Baalbek, January 2007. 35For instance, a dozen schools in the region of Baalbek united in the early 1990s – even before the establishment of al-Mahdî schools – for a Tajammu’ al-madâris al-islâmiyya al-fardiyya (Gathering of Individual Islamic Schools). The goal of this gathering was to obtain Hizballah’s protection and pedagogical services, and become part of the party’s sphere of influence. Among the schools which fit in this category is the school personally owned by Mohammad Yazbeck, one of Khamenei’s representatives in Lebanon, in Bouday, as well as al-Manâr school near Baalbek. Hizballah’s sponsorship in these schools takes shape in the organization of training sessions for teachers and granting scholarships34. Associations like al-Imdâd may also offer financial aid to students from poor families. 36Other schools also spread Hizballah models and act as satellite organizations in the southern suburbs of Beirut and in South Lebanon. Here, this often takes the shape of a more informal influence on small-scale associations, such as al-Nur, an association located in al-Dâhiya that manages five schools clearly modeled on Hizballah-run institutions. Other individual schools in al-Dâhiya adopt more or less spontaneously symbols and practices that are likely to earn themselves the label “school allied to Hizballah schools” in the broadest sense. 37Intermediate situations such as these underline the vague character of the associative and social universe connected to the Hizballah sphere of influence and bear witness to the party’s numerous relations, to its influence in these regions and also to its methods for expanding its base. This halo effect is further emphasized when the public system itself becomes permeable to party influences under the aegis of a school headmaster or other important person from the world of education in regions loyal to Hizballah. As a whole, we can consider that a large proportion of Shiite schools show signs of a more or less pronounced “Hizballah-ization” under the combined influence of mimicking, the spreading of social and religious models, the use of similar pedagogical techniques, not to mention the resources made available to party followers. The spread of Hizballah education is therefore often less a result of coercion than a result of the party’s strong cultural hegemony on Lebanese Shiites in the 2000s. All these schools – from al-Mahdî network to Hizballah-affiliated individual schools – feature strong endogamous communities since they are located in predominantly Shiite regions and target Shiite followers. They mark the territoriy in the regions of Bekaa, Southern Lebanon or the southern suburbs of Beirut; such institutions undoubtedly contribute to bringing these regions closer together on the cultural and political levels. Beyond the image of a closed “counter-society”, in the end, Hizballah emerges as an alternative social model, which spreads within the Shiite community. 38InHizballah-related associations, foreign relations, especially with Iran, vary from one institution to another according to the circumstances of their establishment, evolution, financing and leaders. While the “parent company” of some associations, such as al-Shahid35 and al-Imdâd, is located in Iran, this does not hold true for the JTDI or for al-Mahdî schools. These two networks do receive Iranian funds, however, whether from private institutions or from networks within the Iranian regime itself (Eisenlhor, 2005). As for al-Imdâd, it has maintained connections with its country of origin (Fawwaz, 2004), as shown by the fact that many Iranian personalities frequently attend ceremonies and events organized by the group. Still, the association manages several technical centers and schools for handicapped children, and as such, it is one of the most active collaborators of the Lebanese Ministry of Social Affairs, which subsidizes this kind of institution. In addition, al-Imdâd owns at least one “free private” primary school for which it receives subsidies from the Lebanese Ministry of Education, as is the case with many private subsidized schools. In addition, Ali Zreiq, president of al-Imdâd organization, is considered a public figure as head of the Khiyam municipality. 39Conversely, the JTDI was established by Lebanese clerics and was originally close to the Higher Islamic Shiite Council (al-Majlis al-islâmî al-shi‘î al-a‘lâ), the official representative body which is partly financed by public funds. It later moved away from the council however and became autonomous. Today, it has taken over the Council’s task of paying religion teachers who are assigned to predominantly Shiite public schools. Furthermore, the JTDI has a much more distant relationship with Lebanese ministries than al-Imdâd since al-Mustapha network has no technical or “free private” schools in its network. The classification of NGOs that are allied with Hizballah as partners of the Lebanese state, or conversely as elements of a hypothetical “state within the state”, or even as elements which depend on a foreign state, is therefore a much more complex and subtle process than it would seem. Allegiance and dependencies are far from being definitive and mutually exclusive. 36 Interview, Amal al-tarbawiyya, July 2008. 40As to the insertion of these “Hizballah schools” in the broadest sense of the word into the Shiite educational landscape, it seems to be more about competition than about genuine cooperation. Relations between Shiite networks, which were still in an embryonic stage in 2005, gained a somewhat formal aspect with the creation of the “Meeting for Cooperation among Islamic Schools” (Liqa’ lî tawthiq al-madâris al-islâmiyya) in 2006. This meeting brings together the Amal al-tarbawiyya, Mabarrât, al-Mahdî, al-Mustapha and al-Imdâd networks to coordinate festivities and holidays, and even share some educational methods36. This new association organizes joint competitions for sports and recitals of the Holy Koran and it also aims to eventually standardize some of the books used in these schools, such as English language textbooks. In 2008, the meeting, which was based on an initiative undertaken by Amal al-tarbawiyya rather than by networks close to Hizballah, had yet to succeed in achieving concrete results in the area of education. Apart from monthly meetings held by the directors of its five member associations, the initiative is characterized by the lack of any genuine cooperation or successful centralization of the various Shiite networks. This is in sharp contrast with their Catholic counterparts, who coordinate a special-interest group to express demands and defend interests. 41In the end, in contrast with its original idea of promoting radical change from former practices and institutions, Hizballah maintains more or less solid and direct ties with local and national institutions whose rules and regulations it has come to accept. 43Constraints which are specific to the Lebanese market of private education limit however the possibilities of these associations with regard to identity and education. The promotion of ideological models is combined with the objective of scoring good results on official state exams, which tends to standardize the content of courses across all communities. Socialization models therefore develop via extracurricular channels rather than during actual classes as such. The types of history and religion textbooks that are used and the messages transmitted orally in the classroom endorse different visions and perspectives and clearly reveal the existence of some political biases. Yet these models are primarily expressed through conferences, clubs, school plays, religious ceremonies such as ‘Ashura, or graduation ceremonies, all of which represent markers and symbols which spread the party’s vision regarding religion, Lebanese society and, of course, the party itself. 37 On this issue and regardless of the school context, refer to Mervin (2007). 44The taklîf ceremony, organized for young girls who have come of age and who are ready to wear a veil and to assume their “religious responsibilities”, was imported from Iran in the 1980s and is one example of these religious and partisan events. It also bears witness to certain processes of hybridization. Indeed, this female rite of passage, while borrowed from the Iranian society after the Islamic Revolution, gives rise to speeches and plays that are rooted in the Lebanese context and that glorify the Islamic resistance against Israel as well as the heroes of this resistance37. The taklîf ceremony aims to develop religious and partisan identities from an early age; it is part of the Hizballah device of narratives and symbols which cements allegiances. This is especially true since the ceremony is broadcast by Hizballah media and therefore shown beyond the circle of school goers. Theatre in particular, by staging the local and regional issues which face members of the “resistance society”, aims to create an “emotional community” that is likely to reinforce bonds within the militant system. 45As for the individual, going to a Hizballah school is tantamount to progressing from being a non-initiate to a “prospective initiate” (Sironneau, 1982, p. 423), from the status of “them” to that of “we”, through the knowledge spread by the party, the sociability it promotes and the rites it abides by in these institutions. Nevertheless, such religious and ideological models, which come in several versions according to each network, are not received passively; they are rather actively integrated into diverse local or family paths and configurations. 46SomeHizballah officials make no secret of their desire to partly reshape society through Islamic schools which are a vehicle providing indirect access to the family circle, in an effort to normalize and rationalize its functioning in the long run. The spread of social and religious models via the school environment is a result of this effort to broaden the scope of a militant religious program. The idea is to “discipline” and make religious practices public (Deeb, 2006) by verbalizing them, by granting them a meaning within the framework of the Islamic resistance and by making children the vehicles of a movement aimed at extending these practices into society. Though risky, this attempt at socialization by reaching out to children and their families in a seemingly random way becomes obvious when teachers give remarks and advice to students as well as instructions to their parents during school and religious events. 47Interviews with teachers in Hizballah-affiliated schools suggest that for some of them, religious belief and practice grow with time, which may lead to the hypothesis that the teachers themselves are also sensitive to the socialization models to which they are exposed and which they are asked to implement in their schools. Such an assertion must be qualified and contextualized however. As far as students and teachers are concerned, socialization seems to be an interactive process that is never passive or complete. Furthermore, understanding the meaning of the Islamic sphere can happen in different ways and for different reasons, and can even be selective at the religious or political level. 48The complex political socialization processes are theorized in different models, which seek to balance the influence of family and of secondary socialization agencies such as school. The “life-span change” model which stresses the importance of learning processes throughout life opposes the so-called “model of persistence”, which emphasizes the cause-to-effect relation between learning processes and subsequent experiences (Joignant, 1997, p. 540). In the case of Hizballah and its institutions, and regardless of the importance of this or that socialization agency, the stability of social environments which an individual experiences in the “resistance society” helps cement the acquired norms and values, since they remain valid from one institution to another. The scope and diversity of the environment in which each member can play an active role contribute to making such standards efficient and relevant on a daily basis. The existence of cumulative processes among the various institutions can be observed in a region such as al-Dâhiya. For instance, the relationship between family, school and leisure institutions is often characterized by congruence and complementarity rather than competition. Student or peer groups that are formed in school are important in influencing the political socialization process38. Individuals draw their own paths and networks within these binding structures and abide by prescribed methods in their own way while maintaining a certain distance. This distance increases the further we move away from al-Mahdî schools, which are the closest to the party. We will hereunder attempt to understand the effect of the party on the “outer edge” of the party’s core. 49According to questionnaires distributed to teachers in al-Mustapha schools39, while the Islamic character of schools does not totally condition their vision and strategies, it is correlated to their representations and practices within the school, suggesting that the approach of these teachers is far from being purely instrumental vis-à-vis the institution where they work. Faith enables these teachers, here more than anywhere else, to give meaning to their real-life experiences40. Nevertheless, faith does not make teachers insensitive to more pragmatic considerations in Hizballah schools. For instance, one teacher says that he joined one of al-Mahdî schools in the Bekaa because he needed a job, but that he quit his position one year later for another Hizballah-affiliated school because his salary was not high enough. Although he said he was generally in favor of the religious and political principles spread by al-Mahdî schools, he also questions whether or not he would one day enroll his own daughter in one. 50Meanwhile, many other – mostly Shiite – teachers in Hizballah schools perceive teaching as a mission (risâla), if not a vocation. Religious and moral incentives are frequently evoked to describe the activity within the school. Yet when these same teachers have to choose a school to enroll their own children, they almost always take into consideration other elements such as the level of education or the quality of teaching in foreign languages. 51As for parents who have chosen Islamic schools such as al-Mustapha and al-Imdâd schools, the level of education is said to be as important as religion41. Religion is often perceived as an ethical model and a set of life rules within the school environment, more than just a spiritual and dogmatic learning process. Little does it matter then that it be an exact replica of the religious practices learned at home. Indeed, many parents – at least within these networks – want their children to acquire a corpus of moral values and standards, albeit without glossing over the quality of education. 52A municipality councilor who was elected on the Hizballah list in one of the party’s stronghold cities explains that his children went to schools close to Hizballah because he believes that although not sufficient by itself, an Islamic education is the key to successful integration into society. By contrast, a tradesman from Tyre who is not an extremely devout Muslim says that he enrolled his children in a nearby al-Mustapha school due to its high academic standards. He only takes into account the religious dimension of the school for the ethical values it advocates. He does not mind the fact that his teenage daughter takes off her veil outside of school, knowing that she had previously been in a school run by nuns. Another young man from al-Dâhiya explains that members of his family went to Islamic schools, such as al-Imdâd, since these schools were offering protection from precarious situations (handicap, poverty following his father’s death, war), thus using the schools for a more charity-oriented than a religious purpose. Different types of families can integrate Hizballah schools into their systems of moral values, especially since the schools target a socially, if not politically, heterogeneous public that is sometimes volatile on the educational level. 53In consequence, and in line with their pragmatism, students of institutions such as al-Mustapha and al-Imdâd tend to move around a lot. Exchanges among these Hizballah-affiliated schools are not uncommon, as well as with other private (Islamic or not) schools, including schools run by nuns. Schools run by nuns remain a safe option, including in predominantly Shiite regions, despite the diversity of educational offers. Hizballah members themselves do not hesitate to enroll their children in Catholic schools, giving them precedence over schools like al-Mahdî where the level of education has yet to be proved. 54The political opinions of the teachers surveyed greatly vary, beyond the basic consensus which serves as an axiom within Hizballah’s sphere of influence (the legitimacy of the Islamic resistance against Israel and the superior “Lebaneseness” embodied by Hizballah in this struggle). Teachers in peripheral networks, such as al-Imdâd and al-Mustapha, are not always the “organic intellectuals42” one would imagine, as they do not necessarily perceive the party “in absolute terms” (Sironneau, 1982, p. 428). Their positioning vis-à-vis Hizballah takes into consideration the various components of its political and religious identity and the various aspects of its program, and sometimes disassociates its military actions from its political and social actions. Allegiance to the party is diverse and selective in its reasoning and it also varies in intensity. While the reasons behind the resistance are unquestionable, Hizballah’s involvement on the Lebanese political stage all the way up to the ministerial level can be perceived differently (at least in private), as it naturally entails some compromising. The party’s social institutions are sometimes questioned by the most secular minded43 of supporters, who nonetheless acknowledge the benefits of efforts made by Hizballah to compensate for the Lebanese state’s deficiencies in social development44. 55Teachers, parents and former students who were questioned perceive the party’s religious dimension differently and have varying opinions about the importance of religion. On the whole, these Hizballah supporters, who maintain complex partisan identities, combine religion and politics smoothly. 56Teachers and families are more or less clearly attached to the “resistance society”, which appears to be a group of institutions that exercise strong social control based on some non-negotiable rules and principles. Beyond these indisputable key principles, however, there is no real consensus in the party’s periphery. Nuances exist among Hizballah supporters, or “fellow travelers”, with regard to their opinion about the efficiency of Hizballah’s social institutions, about the importance of religion in the party’s ideology or about the relation between the state, the party and other communities. As the first alumni of Hizballah-affiliated schools begin to join the party’s supporters and militants, partisan dynamics may further evolve. 46 Interviews with Shiite students, June 2003 and the autumn of 2006. 57A second generation of supporters is growing up in Hizballah Islamic schools and is being trained, according to Albert Hirschman’s typology (1970), on the principles of “loyalty” more than on the “exit” or the “voice”. In this respect, former students sometimes prove to be more politically committed and radical than their teachers, as revealed by some interviews conducted in schools allied to Hizballah. While it is still too early to interpret this reality as the result of age or generation, or even as a temporary situation, these emerging groups undeniably display new frames of reference, different from those which prevailed when the previous generation began to show interest in politics in the early 1980s. This new layer within the community, supervised from an early age by Islamic institutions and schools suggests new methods for accessing the world of politics: these methods are based on a pattern of continuity rather than radical change45. For the youngest supporters, the social organization established by the party is perceived as “natural”, as something that goes without saying (Deeb, 2006, p. 226-227). Some students perceive it not only as a cause to defend, but also as an attractive work environment46. 58This phenomenon, which is particularly pronounced in Hizballah’s case, is also partially noticeable within the Amal Movement despite an entirely different relation with the state. 59The educational models implemented in these institutions can be particularly restricting and holistic, but they are nevertheless in constant evolution. Indeed, they are open to negotiations and undergo more or less marginal modifications. The presence of prayer in school (prayer at school was cancelled for secondary classes in al-Mustapha schools due to time constraints), mandatory learning of Koranic verses in preparation for internal competitions at the end of the school year, relative strictness regarding the issue of school uniforms, the separation of boys and girls in class when they become teenagers or at an earlier age… all these issues are dealt with in a pragmatic and incremental way. In this sense, Hizballah schools also become a place where social dynamics are produced: some are centripetal of course, but some can also be centrifugal as far as the party is concerned. Some students toy with the codes and seek to distort them, whereas others never miss an opportunity to highlight the existence of certain standards and the need to respect them. In a major Islamic school for girls in al-Dâhiya, for instance, some high school students complained about a certain “decline in moral standards” within the school, thus stirring a debate and embarrassing the school supervisors47. Such situations ultimately reflect the social negotiations and changes which take place within and around Hizballah’s circle of influence. 60The party is then confronted with the question of consolidating loyalty among this new support base related to Islamic schools, while it also has to control the social change that is induced by these institutions. Though currently modest in number, these future graduates of Hizballah schools are likely to play a key role in the near future due to the demographic and sociopolitical configurations in which they fit. It remains to be seen whether their network will be limited to the sphere of the hala islamiya, whether they will broaden their reach across society and spread the party’s values and practices, or whether they will distance themselves from Hizballah. Their actions will depend on the degree of control Hizballah leaders and institutions will be able to retain, using their symbolic credibility and, at the same time, their capacity to meet defined social and political expectations. 61Hizballah’s sphere of influence gives rise - more or less clearly depending on the network - to a social project characterized by a holistic approach to the individual, a complex set of institutions embedded in different social development areas, and the emergence of highly-structured and standardized life models. These models aim to reinforce a cohesive “Islamic resistance society”, which – according to party officials – is called upon to shape the Lebanon of tomorrow. 62This sociopolitical and religious action allows Hizballah to build a “cultural hegemony” on a much broader foundation than that of its active militants, by relying on a moving institutional network to which it is linked more or less clearly. In this respect, a considerable portion of the lower middle class graduating from the schools covered by this study is undoubtedly less under the direct control of Hizballah than under its indirect influence, via the educational networks linked to the party. These new Islamized lower middle classes are the result of decades of consolidation of the Shiite community, as well as the product of Hizballah’s more recent efforts in the field of education. 63While the future of these schools is currently unpredictable, these institutions still give rise to multiple questions for the researcher. On a theoretical level, they explain politicization methods, partisan dynamics and the various types of relations between the state and society as expressed by some Islamist parties. On a more concrete level, at stake for the party are the perpetuation and expansion of a base of supporters and militants through these socialization agencies. It is difficult to tell what the future has in store as far as the development of these institutions is concerned, keeping in mind that national and regional dynamics play a key role in local politics. Yet these educational structures still propose models that are likely to rewrite the current sociopolitical equation in Lebanon, regardless of whether they are eventually adopted or challenged. Through such institutions, the future of the Shiite community and – implicitly – of Lebanon itself is in question. Abisaab Rula Jurdi, 2005, “The Cleric as Organic Intellectual: Revolutionary Shiism in the Lebanese Hawzas”, in Chehabi H.E. (ed. ), Distant Relations; Iran and Lebanon in the last 500 years, London, I.B. Tauris, p. 231-258. Abou Moussa Tanos, 1996, Entre identité nationale et identités communautaires: l’enseignement de l’histoire au Liban (Between National Identity and Sectarian identity: the Teaching of History in Lebanon), [in French], PhD thesis, Paul Valéry University, Montpellier III (unpublished). al-Bizri Dalal, 1995, L’ombre et son double, Beirut, CERMOC. Bannout Jihâd, 2008, Harakat Amal; Qissa harakat islâhiyya lubnâniyya fî bilâd al-‘arab (Amal Movement. The Story of a Lebanese Reformist Movement in the Arab World) [in Arabic], Beirut, al-Markaz al-Thaqâfi al-Lubnânî, vol. 10, Beirut, al-Mu’asasât wa al-Muchâraka. Catusse Myriam and Alagha Joseph, 2008, « les services sociaux du Hizballah, effort de guerre, ethos religieux et ressource politique », in Mervin Sabrina (ed. ), Le Hezbollah, état des lieux, Paris, Actes Sud, p.117-140. Charara Waddah, 1996, Dawla “Hizballah”: lebnân, mujtama‘an islâmiyyâ (The Hizballah State: Lebanon, an Islamic society), Beirut, Dâr al-Nahâr. Chazel François, 1993, « La place du politique dans les mobilisations contestataires: une découverte progressive » (The Place of Politics in Contentious Mobilizations: a Gradual Discovery) [in French], in Chazel François (ed. ), Action collective et mouvements sociaux, Paris, PUF, p. 145-159. Chazel François, 2003, Du pouvoir à la contestation (From Power to Contestation) [in French], Paris, LGDJ. Clark Janine, 2004, Islam, Charity and Activism: Middle-class Networks and Social Welfare in Egypt, Jordan and Yemen, Bloomington, Indiana University Press. Deeb Lara, 2006, An Enchanted Modern: Gender and Public Piety in Shi‘i Lebanon, Princeton University Press, 2006. Droz Vincent Philippe, 2008, « Le Hizballah vu par l’administration américaine » (Hizballah through American Administration) [in French], in Mervin Sabrina (ed. ), Le Hizballah, état des lieux, Paris, Actes Sud, p. 65-74. Dumontier Beltram, 2004, Identités et territoires dans le Nahr el-Fidar: une minorité chiite en terre chrétienne? (Identities and Territories in Nahr el-Fidar: a Shiite Minority in Christian Land) [in French], thesis for a M.A. in Geography, Université Paris X, Nanterre. Duru-Bellat Marie, Henriot-Van Zanten Agnès, 2006, Sociologie de l’école (School Sociology) [in French], Paris, A. Colin. Eisenlhor Roschanak Shaery, 2005, Constructing Lebanese Shiite Nationalism: Transnational Shiism and the Lebanese State, PhD Thesis, Chicago. Favier Agnès, 2003, « Histoires de familles, patronage et clientèles dans l’espace politique local au Liban » (Families Histories, Patrons and Clients in Local Political Space in Lebanon) [in French], Annuaire de l’Afrique du Nord, Paris, CNRS Edition, vol. 41. Fawwaz Mona, 2004, « Agency and Ideology in the Service Provision of Islamic Organization in the Southern Suburb of Beirut », in Ben Nefissa Sarah et alii (eds. ), NGOs and Governance in the Arab World, Cairo, American University of Cairo Press, Karthala, Cedej. Ghorawi Mahdî, 2004, Wâqa‘ al-ta‘lîm al-dînî lada al-muslimîn al-shî‘a fî lubnân (The State of Religious Education for Shiite Muslim in Lebanon) [in Arabic], PhD thesis, Saint Joseph University, Beirut (unpublished). Haddad Simon, 2003, “Islam and Attitudes towards US Policy in the Middle East: Evidence from Survey Research in Lebanon”, Studies in Conflict and Terrorism, vol. 26, n° 2, p. 135-154. Harb Mona, 2005, Action publique et système politique pluricommunautaire: les mouvements politiques chiites dans le Liban de l’après-guerre (Public Action and Multisectarian Political System: Shi‘i Political Movements in Post-War Lebanon) [in French], PhD Thesis, Institut d’Études Politiques d’Aix-en-Provence. Harik Judith, 1994, The Public and Social Services of the Lebanese Militias, Beirut AUB working papers. Harik Palmer Judith, 1996, “Between Islam and the System: Sources and Implications of Popular Support for Lebanon Hizballah ”, Journal of Conflict Resolution, 03, Vol. 40, no 1, p. 41-67. Herrera Linda, 1999, “Song without Music. Islamism and Education: A Case from Egypt”, Revue du Monde Musulman et de la Méditerranée, n° 85/86, p. 149-159. Herrera Linda, 2003, « Islamization and Education in Egypt; between Politics, Culture and the Market », in Esposito John and Burgat François (eds. ), Modernizing Islam: Religion and the Public Sphere in the Middle East and Europe, London, Hurst and Company, p. 167-189. Herrera Linda, 2006, « Islamization and Education: between Politics, Profit and Pluralism », in Herrera Linda, Torres Carlos Alberto (eds. ), Cultures of Arab Schooling; critical ethnographies from Egypt, State University of New York Press. Hirschman Albert, 1970, Exit, Voice, and Loyalty: Responses to Decline in Firms, Organizations and States, Cambridge, Mass..
Joignant Alfredo, 1997, « La socialisation politique. Stratégies d’analyse, enjeux théoriques et nouveaux agendas de recherche » (Political Socialization. Analysis Strategies, Theoritical Stakes and New Reseach Agenda) [in French], Revue Française de Science Politique, Vol. 47, n° 5. Karam Karam, 2006, Le mouvement civil au Liban. Revendications, protestations et mobilisations associatives dans l’après-guerre (Civil Movement in Lebanon. Revendication, protestation, and associative mobilisation), Paris, Karthala-IREMAM. Kepel Gilles, 2003, Jihad. Expansion et déclin de l’islamisme Paris, Gallimard (Jihad. The Trail of Political Islam, Cambrigde Mass., Havard University Press, 2002). Kriegel Annie, 1985, Les communistes français: dans leur premier demi-siècle, 1920-1970 (French Communists: in their First Centuary. 1920-1970) [in French], Paris, Seuil. Le Thomas Catherine, 2008, « Formation et socialisation: un projet de (contre)-société » (Education and Socialization: a (Counter)-Society Project) [in French], in Mervin Sabrina (ed. ), Le Hezbollah, état des lieux, Paris, Actes Sud, p. 147-172. Le Thomas Catherine, 2009, Mobiliser la communauté; l’émergence d’un secteur éducatif chiite depuis les années 1960 au Liban (Mobilizing the Community; The Emergence of a Shiite Educational System since the 1960s in Lebanon) [in French], PhD thesis, IEP Paris. Mervin Sabrina, « Le théâtre chiite au Liban, entre rituel et spectacle » (Shiite Theater in Lebanon, between Ritual and Show) [in French], in Puig Nicolas, Mermier Franck (eds. ), Itinéraires esthétiques et scènes culturelles au Proche-Orient, Beirut, Cahiers de l’IFPO, p. 57-75. Mervin Sabrina, 2008ezbollah, état des lieux, Paris, Actes Sud. Moussawi Khodr, 1995, Jama‘iyyat al-ta‘lî, « Le lien iranien » (The Iranian link) [in French], in Mervin Sabrina (ed. ), Le H m al-dîni al-Islâmi, ahdâfuha, wa wasâ’îluha al-tarbawiyya wa al-dîniyya (The Islamic Religious Educationnal Association, its Educational and Religious Objectives and Means) [in Arabic], PhD Thesis, Beirut, Saint Joseph University (unpublished). Norton Augustus R, 2000, “Hizbullah and the Israeli Withdrawal from Southern Lebanon”, Journal of Palestine Studies, Vol. 30, no 1, p. 22-39. Percheron Annick, 1993, La socialisation politique (Political Socialization) [in French], Paris, A. Colin. Shapira Simon, 1988, “The Origins of Hizballah”, The Jerusalem Quarterly, n° 46. Sironneau Jean Pierre, 1982, Sécularisation et religions politiques (Secularizaton and Political Religions) [in French], The Hague, Paris, New York. Tilly Charles, 1978, From Mobilization to Revolution, Addison-Wesley Publishing Company. Wiktorowicz Quintan, 2001, The Management of Islamic Activism: Salafis, the Muslim Brotherhood, and State Power in Jordan, Albany, State University of New York Press. Wiktorowicz Quintan, 2004, Islamic Activism: a Social Movement Theory Approach, Bloomington, Indiana University Press. 1 Refer in particular to al-Bizri (1995, especially p. 25-35); Harb (2005, especially p. 203 sq); Deeb (2006) and Le Thomas (2009). 2 Still, groups supporting the Islamic Revolution in Iran started forming as early as 1978 in Lebanon. 4 Schools close to Hezbollah are not always established in villages known to be party strongholds; conversely, they are not located in “mission territories” the party seeks to win over. The relation between the presence of a school and the party’s score in the municipal elections is far from being apparent, as proven by the results of the 1998 and 2004 municipal elections. Besides, local strategies must also take into consideration the logic of families, which is as influential as (if not more so than) party considerations in villages (Favier, 2003, p. 58). 6 For a detailed description of these institutions, refer to (Bannout, 2008; vol. 10: al-Mu’asasat wa al-muchâraka). 7 Nevertheless, it is necessary to qualify some cases on the local level, such as in the municipalities of the southern suburbs of Beirut, where one witnesses merging phenomena between some of the party’s social organizations and local public institutions. When organizing youth-oriented activities, the municipality of Ghobeiri is, thus, using the school buildings of Islamic networks or even Hezbollah leisure facilities (Le Thomas, 2009, p. 258-259). 8 Drawing on Annie Kriegel’s approach with the French Communist Party, Waddah Chararah (2004, p. 19) used the image of concentric circles to understand a party like Hezbollah. He thus described the party and its circle of influence as an ensemble of four concentric circles: the two largest circles are public, whereas the remaining two central circles, which are intended for “the initiated”, remained closed and secret (cadres, fighters, families of martyrs). Accordingly, schools can be located in the third and fourth circles according to the networks, or even between the second and third circles in the case of the al-Mahdî schools, which are more inaccessible to an outside public. 10 To consult the organizational chart of this association, refer to: http://www.almahdischools.org/newsite/_structure.php?filename=200708130326300 (Retrieved, February 7, 2009). 11 Hussein Hajj Hassan was responsible for education within Hezbollah in the 1990s. During the first decade of the third millennium, he became an honorary member of Hezbollah’s educational structures (interview with Hussein Hajj Hassan, February 2007). 14 For more information of the al-Mahdî schools and Hezbollah’s Educational Unit, refer to: Le Thomas (2008). 15 Verifying the composition of personnel and students of al-Mahdî schools has proven to be impossible in the field due to the difficulties encountered in gaining access to these schools, which seem to represent Hezbollah’s “educational private property”. 17 Al-Imdâd helps families who have lost their main source of support and who do not have access to other institutions close to Hezbollah (Deeb, 2006, p. 90). 22 According to Dalîl al-madâris, the guide issued by the Lebanese Educational Center for Research and Development, 2004-2005, p. 206. 24 These principles can be found, for instance, in the chapters dedicated to the concept of jihad (Al-Islam Risâlatunâ, a grade 9 school book, chapters 10 to 13) or in the summer sessions organized for the benefit of the JTDI teachers (See Moussawi (1995, chap. 4)). These commitments remain implicit, as the JTDI aims to spread an “apolitical” vision of religion that is broad enough to concern the whole community. 25 Interview with the inspection official at the JTDI, September 2005; this paragraph is based on interviews with JTDI managers and teachers and on observations conducted in some of its schools. 26 It is competing with the book entitled al-Tarbiyya al-dîniyya (Religious Education), which is published by the Higher Islamic Shiite Council but is less widely used than al-Islâm risâlatunâ. Al-Tarbiyya al-dîniyya is mainly used in some southern schools as well as in the schools that are close to the Amal Movement. 28 Especially in Beirut and Tyre (al-Hawsh) schools; the schools affiliated with the association do not charge the same school fees, as there are differences between well-off regions and other, poorer ones, such as the North Bekaa. 29 With regard to Islamic education and its public, Linda Herrera (1999) questioned this concept as far as Egypt is concerned. Janine Clark (2004) speaks of a similar phenomenon in the institutions affiliated with the Muslim Brotherhood in Jordan. For more general information on Islamism and middle classes, refer to Kepel (2003). 30 On the importance of the middle classes among Hezbollah’s supporters, refer to Harik Palmer (1996, especially p. 55-56); Haddad (2006); Norton (2000). Harik Palmer and Haddad both suggest that support for Hezbollah spans across the socioeconomic spectrum and that the party has a relatively complex social base (p. 56). 31 On history books in Lebanon and their use in schools, refer to Abou Moussa (1996). On the use of these books within the Shiite community, refer to Le Thomas (2009, p. 458-490). 32 Shiite religious tax, which is equal to one-fifth of the profits made by the believers and which may be transferred to duly authorized charity associations. 33 Speech delivered by Mohammad Fneish in an al-Imdâd school, December 15, 2006 (partly broadcast on al-Manâr). Fneish was, at the time, (resigning) minister of Energy. 35 Al-Shâhid, or the Martyr’s Foundation, used to manage the al-Shâhid school in Dâhiya; however, this school has been run since 2004 by the Islamic Institution for Education and Teaching. Al-Shahîd visibly shifted its focus on medical services in Dâhiyaand also manages a technical center affiliated with its hospital, al-Rasûl al-‘atham. 38 On the importance of sociability networks among students, refer to Duru-Bellat, Henriot-Van Zanten (2006) and Percheron (1993). 39 Survey performed via a questionnaire in two al-Mustaphaschools in parallel to other Islamic schools in the autumn of 2007. 40 This is similar to the “sense of mission”, which was mentioned by M. Fawwaz (2004, p. 361) about the personnel of Islamic NGOs in the southern suburbs of Beirut, especially the duty to help the community, for religious motives.. Also, refer to Wiktorowicz (2001, p. 85). According to Wiktorowicz, this sense of mission to be accomplished is what distinguishes Islamic NGOs from their secular counterparts more than the nature of the activities as such. 41 According to the interviews conducted with teachers and parents of students in these schools in the autumn of 2005 and 2006. 42 Abi Abisaab (2005) quotes, in particular, Gramsci’s concept when referring to the hawza-trained clerics. 43 On the secularized components of Hezbollah’s base, refer to Palmer (1996, p. 57-58). Based on a quantitative survey conducted in 1993, Harik argues that the level of religiosity is only weakly related to political leanings within the Shiite community. In contrast, Haddad (2003, p. 31) contradicted his own previous conclusions. He underlines far more than Harik the importance of religion within the framework of affiliation with Hezbollah. Nevertheless, the two studies are not as incompatible as it may seem since a section of secularized Shiites consider themselves more or less close to Hezbollah depending on circumstances and on the party’s policies. It is worth mentioning that the abovementioned surveys were conducted in the autumn of 2006 at a time when Hezbollah benefited from an impressive rise of popularity on the political stage and within the Shiite community. Crowned with the prestige of “divine victory”, it had the advantage of being in an unprecedented, “abnormally enlarged” position (according to the Taif Agreement system), which modified – as a result – the guiding principles within the group and beyond it. The classical division between Hezbollah and other Shiite forces did not disappear; rather, it seemingly led at this stage to an increasing distinction between practicing and non-practicing Shiites within the framework of the same circle of influence, which is favorable to Hezbollah and to its policy of resistance. 44 However, it is worth noting that many managers of these networks that are close to Hezbollah insist, in their “official” discourse, on the need to improve the public system and emphasize the palliative character of Hezbollah’s educational actions in this field. 45 Refer to Deeb (2006, p. 226-228); and Harb (2005, p. 365-67) on the renewal of Hezbollah’s political base. Dr C. Le Thomas, historian and political scientist, has a PhD from the Institut d’Etudes Politiques de Paris. THOMAS, Catherine Le. Socialization agencies and party dynamics: functions and uses of Hizballah schools in Lebanon In : Returning to Political Parties? Partisan Logic and Political Transformations in the Arab World [en ligne]. Beyrouth : Presses de l’Ifpo, 2010 (généré le 20 avril 2019). Disponible sur Internet : <http://books.openedition.org/ifpo/1093>. ISBN : 9782351592618. DOI : 10.4000/books.ifpo.1093. Thomas, Catherine Le. “Socialization agencies and party dynamics: functions and uses of Hizballah schools in Lebanon”. Catusse, Myriam, et Karam Karam. Returning to Political Parties? 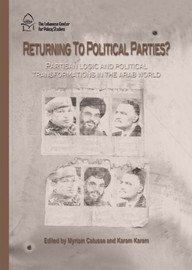 Partisan Logic and Political Transformations in the Arab World. Beyrouth : Presses de l’Ifpo, 2010. (pp. 217-249) Web. <http://books.openedition.org/ifpo/1093>. CATUSSE, Myriam (dir.) ; KARAM, Karam (dir.). Returning to Political Parties? Partisan Logic and Political Transformations in the Arab World. Nouvelle édition [en ligne]. Beyrouth : Presses de l’Ifpo, 2010 (généré le 20 avril 2019). Disponible sur Internet : <http://books.openedition.org/ifpo/1067>. ISBN : 9782351592618. DOI : 10.4000/books.ifpo.1067. Catusse, Myriam, et Karam Karam, ed. Returning to Political Parties? Partisan Logic and Political Transformations in the Arab World. Beyrouth : Presses de l’Ifpo, 2010. Web. <http://books.openedition.org/ifpo/1067>.